Finally!! Pictures of Enlai's crib and dresser!! We have been looking for the crib set for a while and we finally found one that Lily really liked!! Now the story behind it is even better. We found it online at Wal-Mart and the closest one, according to the online search, was 4 hours away in California. 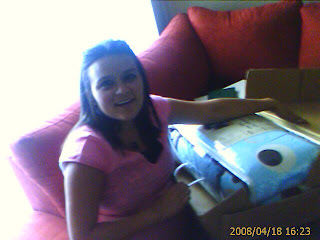 Mike called his dad and he was in Oklahoma and asked him were he was and started to search for the crib set throughout the U.S. Mike's dad drove a few hours out of his way to buy this blue crib set to send as a surprise for Lily and Enlai. It arrived to our home last friday, so Mike went to go buy the recieving blankets at the Wal-Mart close to home and lo and behold, the CRIB SET WAS 3 MILES AWAY FROM HOME ALL ALONG!! Well it was still a surprise to get it through the mail and see Lily open her gift!! uno que le gusto a Lily!! sorpresa y Lily disfruto abrir su regalo!! ah, how beautiful. it looks really good guys! i love the crib a lot. the print on the bumper and stuff is great too! ahhhhh, just a few more weeks.